I have been asked to describe how EditTools fits in the editing process. I have avoided doing so because each editor works differently and the way I edit suits me but may not suit someone else. However, I have been asked that again as part of a question about EditTools, and I have decided that perhaps the time has come to explain how I use EditTools in my editing process. Usually the manuscripts I edit — all nonfiction, with a majority being STEM (science, technology, engineering, and medicine) — come to me in groups of a few chapters. Occasionally I will receive the entire book, but even then it is usually divided into chapter files. When the book is given to me as a single file, I divide it into chapter files. I know some editors prefer to work with a single file that represents the whole book. I do not, for a number of reasons, not the least of which is that the books I usually work on are much too long to effectively edit as a single file — sometimes a single chapter runs more than 400 manuscript pages. In addition, Word is not the most stable of programs, and the larger the file (and the more that goes on in the file), the more likely it is that Word will crash — and keep on crashing. More important, however, is that by working on chapter-size files, I can add to my EditTools datasets and have those additions applied in future chapters. Without reading every word, I cannot know in advance every decision that I need to make. By running this macro, I eliminate many (not all) of the author-created styles that aren’t used in the document and narrow the number of styles that I need to deal with. After that, I run the Cleanup macro (#2). The Cleanup macro has its own Manager (shown below), which lets me set what I want cleaned up (#3). It also lets me link to a Specialty file (#4) for additional cleanup that is specific to the project (or type of project) I am working on. The Manager lets me set the order of the cleanup by moving the items around, although I don’t bother — instead I run the macro twice. The main field shows me what will be done (#5). 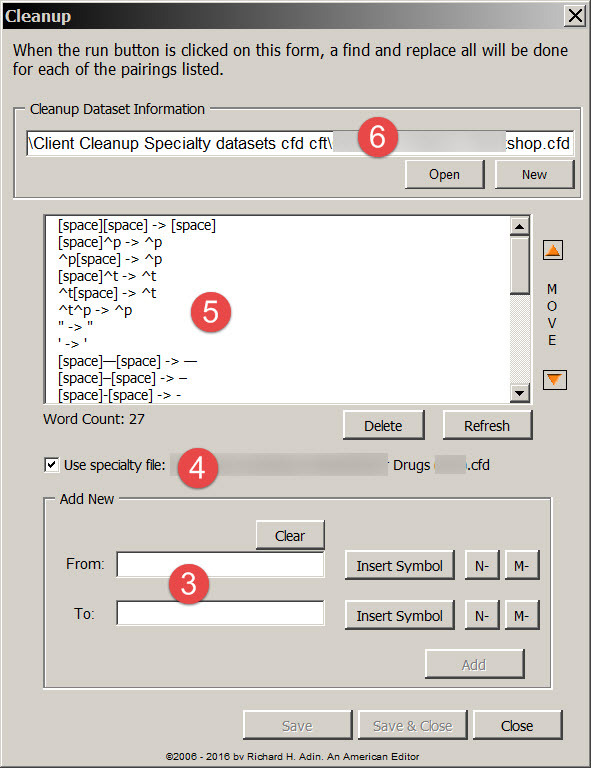 And, as is true of all EditTools datasets, I can save my cleanup profile (#6). What that means is that I can create custom cleanups based on client or type of project or any other criterion and recall them as needed. As part of this step, I also run the Change Style Language macro, which is found under Other on the Other menu, as shown here. After I have made my choices, I click Update and the macro will update the document’s styles. After the Cleanup step, I code or style the document. In the “olden” days, I applied the codes or styles as I edited, but with EditTools, it is easier and quicker to apply them before editing begins. I may change some during editing (e.g., change a numbered list to a bulleted list), but nearly all remain as originally coded/styled. Note that the sample is the 9th edition of a book (#7). I took the project-specific Code Inserter dataset for the 8th edition of this book and copied it for the 9th edition, and then made whatever changes were required, such as in head casing (#8) or options (#9) or code to be used (#10). Within a few minutes, I was set to begin coding. The same is true with the Style Inserter, shown below. Often a client uses standard designs rather than creating a new design for each book. The client tells me the standard design to use for the project and I open the style dataset (#7) for that design. Again, I may need to make some adjustments (#8, #9, #10), but once I have created the basic dataset, I can reuse it repeatedly (#7). The Style Inserter Manager is very similar to the Code Inserter Manager. 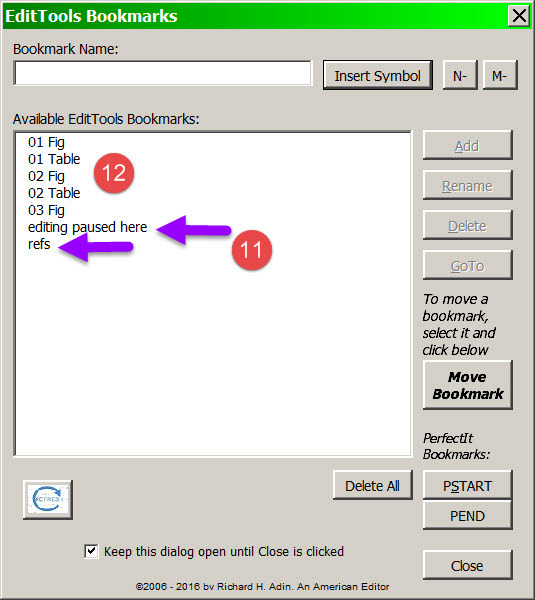 At the same time that I open the Inserter (Step 3A), I open the Bookmarks macro, shown below. (In cases where I do not have to code/style, this is the only portion of Step 3 that I do.) I always add two bookmarks — refs, which is required by the NSW macro, and editing paused here, which is my generic bookmark for when I pause in editing for some reason (arrows & #11) — to every manuscript. In addition, as I code/style, I insert a bookmark at each table (e.g., Table 01, Table 02, etc.) and figure (e.g., Fig 01, Fig 02, etc. ), and at any other item, such as boxed text, that I may need to find again. I use the bookmarks as a way to track what tables and figures have been called out in text and edited. They also provide an easy way to get from my current location to where the table or figure is located, and back again. After I edit a figure, for example, Fig 01, I change its bookmark name to x Fig 01 edited. The x causes the bookmark to move to the end of the list and edited tells me that it has been edited. This makes it easy to catch a missed text callout as well as to get to and from a figure, table, or other bookmarked text. Part II continues the preediting steps (Steps 4 and 5) and introduces the first editing step (Step 6), which is editing the references. Part III discusses the final step (Step 7), editing the text. It has been a long time since the last update to EditTools was released. Macros can be troublesome things, and it has taken longer than I had hoped to make some of the macros perform as I wanted. 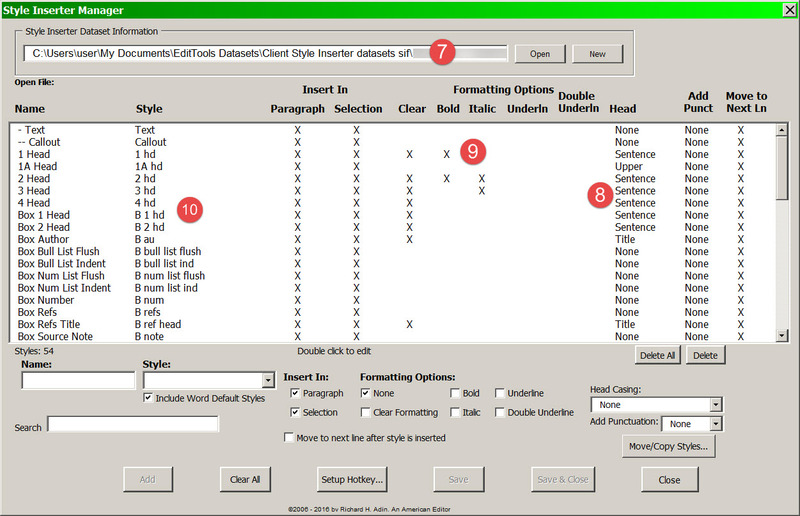 EditTools 5.0 is a free upgrade for current registered users of EditTools. It is available at wordsnSync. Before I describe some of the enhancements in version 5, I want to discuss a couple of common misconceptions about EditTools. First, EditTools is usable by ALL editors — whether the editing subject area is STM, humanities, law, business, fiction, science fiction, or any other area. 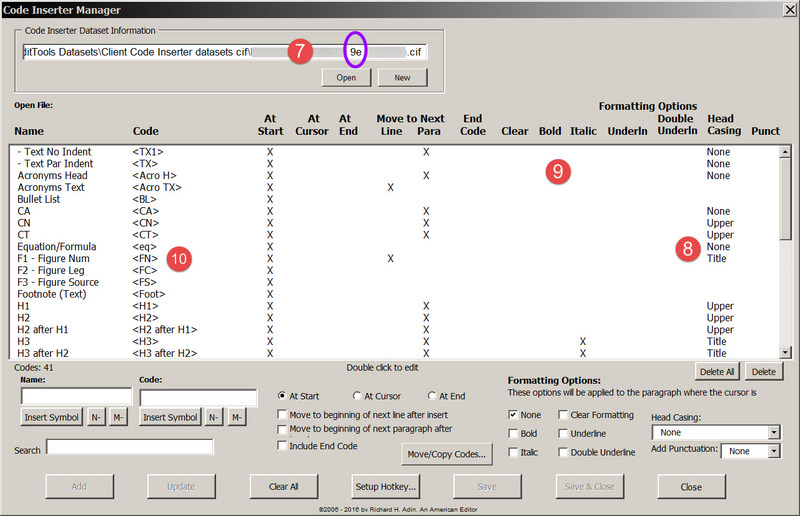 Alas, too many editors take a look at EditTools and the examples of what various macros do, see that the default labels and the examples are for medical books, and go no farther. The labels and examples are because I do medical editing and I created these macros for use in my work. However, most of the tabs in the dataset managers are easily renamed. There is a button on the tabs titled Change Tab Name. Just click it and you can change, for example, Never Spell Words to Always Change These Words or to Matilda’s Vocabulary Checker or to whatever has more meaning for you. And the datasets that these tabs use can be named anything you want and contain the information you choose. Although not all of the macros are usable by every editor in every editing job, most editors who use EditTools have a few macros that are favorites and used regularly; but as is true of any macro collection, there will be macros that are not used at all by a particular editor. Several of the macros that I used with great frequency 5 years ago, I rarely use today (e.g., MultiFile Find and Replace); others I use many times an hour, every day, and on every editing job (e.g., Toggle and Search, Count, & Replace). 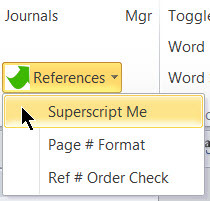 Some of the macros are intended to be used only once on a document (e.g., Never Spell Word and Journals). My point is that if you have not tried EditTools because you think it is for STM editing only or because you see some macros that you think you would never use, you should rethink your view of EditTools and give it a try. I push EditTools, the Editorium’s Editor’s Toolkit Plus, and Intelligent Editing’s PerfectIt because I know, from my own experience and from the experiences users have related to me, that these three programs can help you increase your productivity, efficiency, speed, and profitability. In the case of EditTools, the need to increase those aspects of my editing is what led to the original creation, and the continuing enhancement of, EditTools. New in version 5 of EditTools are these macros: Cleanup; the complementary macros Convert Highlights to Styles & Convert Styles to Highlights; Change Style Language; and Quote Conversion. In addition, numerous fixes and enhancements have been made to other macros. What follows is a brief introduction to the new macros. 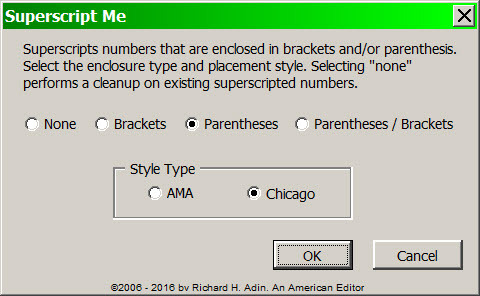 Although I run the Editorium macros that clean up my files, there is always something that Editorium’s FileCleaner (included in Editor’s Toolkit Plus) doesn’t do because no one would have imagined an author doing this. That’s where Cleanup comes into play. Cleanup lets me design my own cleanup macro. It has a manager that makes it easy for me to enter things I would like changed universally without tracking on. 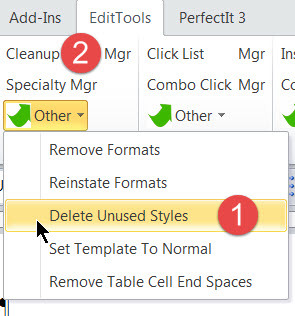 (Cleanup does not offer the Track Changes On option.) For example, if a client wants all em-dashes changed to spaced en-dashes, I use Cleanup to do it. Cleanup has both a general (things I want done on all files) Manager that saves to a general file, and a Specialty Manager that lets me create a separate, special cleanup file for a particular project or client. Cleanup should be run on a file before any other EditTools macro is run. For more information, see the explanatory page at wordsnSync. The Convert Highlights to Styles and Convert Styles to Highlights are paired macros; that is, you run Convert Highlights to Styles before you begin editing and — very importantly — before any other EditTools macro except Cleanup. Convert Styles to Highlights is the very last macro you run and — very importantly — it must be run after Remove All Highlighting. This macro pair is useful in many situations, but here are the two primary uses I make of the macros. The first situation is when I receive files from clients where some material has been highlighted and the client wants the highlighting to remain. Before these macros, this was problematic because EditTools relies on highlighting to communicate with the editor. Consequently, the client would receive either a file loaded with extraneous (to the client) highlighting or without any highlighting at all, unless I manually rehighlighted what the client wanted left highlighted, which would be a waste of my time and cost me money. The second situation, which is the more usual one, is when I receive a file with no highlighting that the client wants kept but that has callouts for figures and tables (or anything else) that have to be brought to the compositor’s attention. In these cases, I like to use highlighting but haven’t been able to unless I searched for and manually highlighted each callout/item after I ran Remove All Highlighting. That wasn’t so bad when there were only a couple of tables or figures, but I have had files with dozens of each called out. In the first instance, running Convert Highlights to Styles converts all of the client’s highlighting to a style and removes the highlight. Then, when I am done editing and have removed all of the highlighting I have added, I can run Convert Styles to Highlights and the client’s highlighting is back in place. And for callouts, I can apply the style to them so they are highlighted as well. In the second instance, I search for the first callout and I apply highlight to it. I then run the macro to convert it to a style. This adds a style to the list of styles. Now when I come to a callout, I simply apply the style. Then, when I am done editing and have removed all of the highlighting I have added, I run Convert Styles to Highlights and all of the callouts are in highlight. I find it frustrating when I receive a file and the document language is not set to English. So, I apply English to the “whole” document only to discover that in many of the multitude of styles the document has, the language has been set to something other than English and/or Spell Check has been turned off in the style, and my attempt to set the whole document to English and turn on Spell Check has failed. 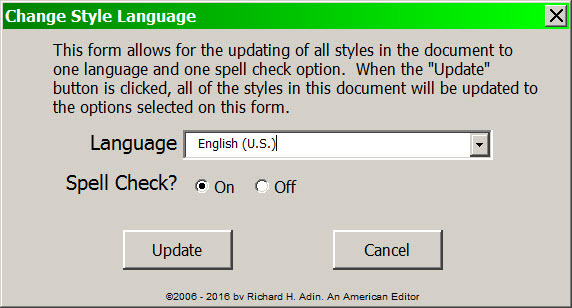 Change Language Style lets me choose a language and choose to turn Spell Check on or off and have that information made a part of each style in the document. Running the macro means it goes through all of the styles in the document and changes all of the language and spell check settings to what I have chosen. Unfortunately, it doesn’t work on all styles. 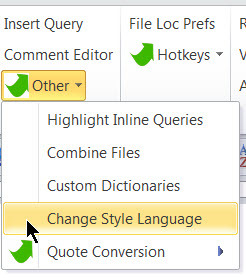 Microsoft has some built-in styles that cannot be changed this way (particularly “attribute styles”), but the change is made to the great majority of styles. It may not be perfect, but it makes life easier and solves a problem editors often encounter in a minimum amount of time. The final new macro is Quote Conversion, which has two submacros: American Quotes to British and British Quotes to American. This macro is simple but effective. If you receive a document that uses British quotes that need to be Americanized, run British Quotes to American. To go from American to British quotes, run American Quotes to British. EditTools 5.0 adds valuable macros to an already existing array of valuable macros. Check it out and if you are a registered user, be sure to download and install your free upgrade.